Now that I work on the Upper West Side, I have to seek out all new places to eat. 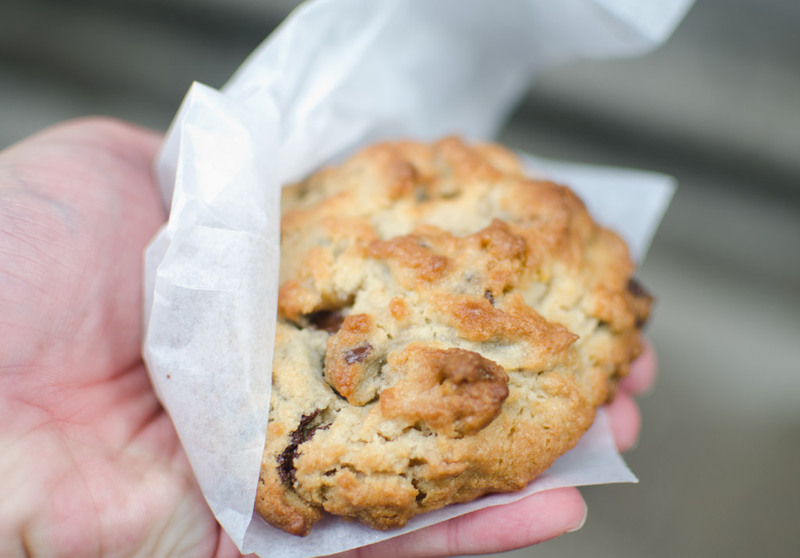 The one place I knew beforehand that I wanted to try was Levain bakery, for the much-celebrated chocolate chip walnut cookie. I had a little bit of sticker shock when I got there, just after 8am. $4 for a chocolate chip cookie? I was handed a still-warm cookie that weighed roughly half a pound, and got a napkin ready. The cookie was the best chocolate chip cookie I’ve ever eaten, and it’s got something for everyone. Like crispy cookies? The outside of the cookie is crunchy and delicious. Like gooey cookies? The interior is gooey and melty. Seriously, I bought another cookie from another bakery about five days later. It was good, but the whole time I was wishing I was eating Levain’s cookie. It has ruined me for all other chocolate chip cookies.